To switch back to an iPhone from Windows Phone (another post coming here to explain the reasons). The Windows Phone is supplied by my Company. Didn’t want to carry two phones around, have two numbers. I didn’t want to sign up for a two year, eighteen or 12 month contract, unlocked iPhone’s are expensive as we all know, but this wasn’t really avoidable, which is where having a fantastic wife helps. My wife has as iPhone 3GS which was out of contract, which we could upgrade to an iPhone 4s for free on O2, for 2 years for an extra £7 per month and of course we retained the iPhone 3GS. She didn’t mind not having the iPhone 4s as she feels it’s not as sleek in form as the iPhone 3GS. So the next problem to be over come was that of networks and SIM’s. For me to use the iPhone with my work SIM, it would have to be a micro SIM and the iPhone would have to would have to be unlocked. Can I ‘unlock’ my iPhone and use it on another network? contract though – you’ll still need to see out of the rest if it. To unlock your iPhone, just fill out this unlocking form and we’ll do the rest. you the phone is unlocked. So the next question that came to mind was, would O2 allow a newly upgraded iPhone 4s to be unlocked straight away? Yes. So the wife and I popped into a local O2 store and I asked the assistant if what I wanted to do (unlock the iPhone) would apply to a iPhone 4s and could I do it straight after the upgrade, he understood the request and he went of to check and he came back and said it shouldn’t be an issue but it must be online and couldn’t be in store. – An mobile phone shop assistant that didn’t BS, who would of thought. So we went though the upgrade, 30 minutes later we left the store with a new iPhone 4s with my wife’s number now transferred to a Micro SIM. For those following, this presented another issue which I already had the solution, more on that later. an email from O2, telling me that the phone had been unlocked and it would hit the phone within the next 3 days. 2 days later my wife received a text informing us that the phone had been unlocked. I’ll be honest I didn’t expect it to go as smoothly as it did and I’m impressed with O2 for doing what they said they would on there site, which as we know isn’t always the case. For those paying attention I had another issue that I had to resolve the different size SIM’s, I had to convert my wife’s SIM from a Micro SIM and my Standard SIM to a Micro SIM. 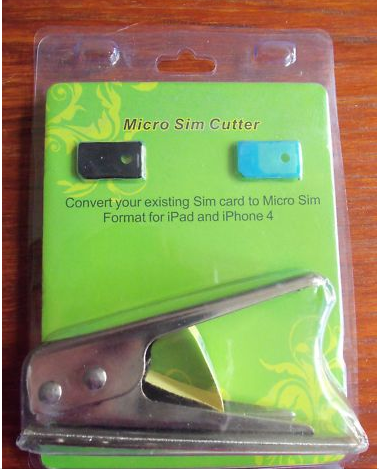 What I needed was a converter and a Micro SIM cutter. A stamp which cuts the correct size of the Micro SIM from a standard SIM. A quick search on eBay and I picked a cutter up around £5 including P&P and with two converters! Once I received the cutter, I found an old SIM (Pay-As-You-Go) and cut it, popped it into the iPad (to test) and it worked like a dream. So I popped my wife’s new SIM into the converter, and put this into her iPhone 3GS and her old phone was up and running as before. I cut the SIM from my Windows Phone into a Micro SIM size and popped it into the iPhone 4Gs and boom I was up and running, checked with the wife that she was happy about anything she wanted to keep, photos, etc.. then I hit the reset on iPhone 4s to factory defaults and I have an up and running iPhone 4S for only £7 extra a month! Which isn’t bad. O2 allow you to change the plan after 12 months, so assuming we can get my wife’s contract back down to what it was before (or less), that means we managed to pick up an unlocked (not jail broken) iPhone 4S for £84.